If you’ve been following me long enough, or even a second, you know I love retellings. Give them all to me. So when I found out this was a Snow White retelling, I hit request immediately. But while many other Snow White retellings have been pushing the envelope, this one stayed the traditional route for about sixty to seventy percent, and by then, it had lost me. 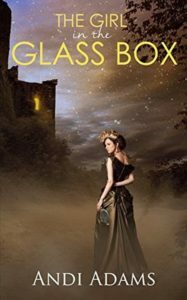 The Girl in the Glass Box tells the story of Agrippine and Genevieve, two women who are not all that different, but who quickly learn through a series of choices, encounters, and devastating losses that the course of their fates can change in an instant. Through the influences of the people they love and lose, both are redefined as their stories head for a different sort of happily-ever-after. (Also this is the first of my attempts at writing mini-reviews. They’re condensed, easier for me to write, and have all the good stuff in them). As I mentioned before, this remains a straightforward retelling until the majority of the book is done. We do get to see the ‘evil queen’s perspective, which is an advantage, but it doesn’t start to subvert your expectations until almost three quarters in. Frankly, with the competition of fairy tale retellings, and Snow White retellings, this just didn’t make the cut for me. I loved Forest of a Thousand Lanterns and Girls Made of Snow and Glass and am looking forward to Boy, Snow, Bird. But this just doesn’t compete – it was not as inventive. That being said, this features a reluctant heroine, which is something I don’t always see – then again that does seem very Snow White-esque. I also just didn’t love Snow as a character. I was never fond of the original tale, so this being closer to that, made me realize as an adult I still don’t like it. And hey, that’s an incredibly personal take to have. I also enjoyed the evil queen’s perspective, especially since a lot of our recent villains are trying to be more humanized, more conflicted, more morally grey. And I loved the ending, which kind of redeemed the beginning two thirds for me. But ultimately to enjoy this, or even love it, you had to put in so much work and read so much that was just not as inventive as I would have liked. You can find The Girl in the Glass Box on Amazon(US), your local indie, and add it Goodreads. What is your favorite retelling? I have to admit that I could quite easily kill off most of the heroines in fairy tales! Far too soppy & dependent for my taste and, come to think about it, it’s not just in fairy tales, that goes for contemporary stories too. Just give me a woman who can stand on her own two feet and can think for herself please!